The Blue Water Community Action Walk for Warmth is an annual event held to raise funds for the Blue Water Community Action Emergency Utility Assistance. This walk is a short, but brisk walk just under two miles. Many of us have no idea what it's like to receive a shut-off notice for our utilities. Come experience the cold to help your community, your neighbor, your friend or family member to keep their utilities turned on during the cold winter months. Funds raised allow us to help those who would otherwise fall through the cracks in getting the necessary help iwth their utility bills. 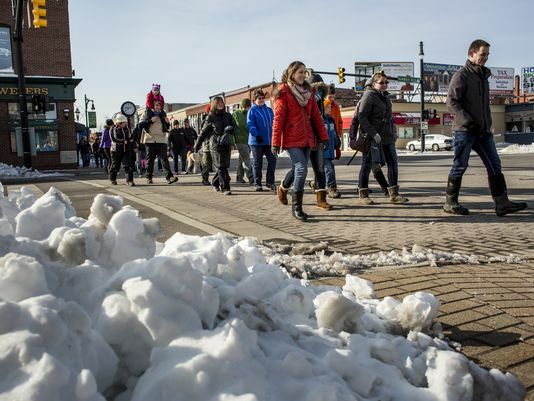 FIrst Saturday in March - the 2019 Walk for Warmth will be held on March 2, 2019. All participants will receive a hot breakfast following the walk. Walkers taking part in BWCA’s Walk for Warmth include volunteers, community members, BWCA staff and clients, families, school and church groups, corporate sponsors, elected officials, local celebrities and you! Walkers who raise $40 or more will receive a free Walk For Warmth T-Shirt - one T-Shirt per Walker/pledge sheet. Flyer's and Pledge Sheets are below for you to use or you may call the Blue Water Community Action at (810) 982-8541 to have one sent to you or you can pick one up at the Main Office. Come alone or gather your friends, family, neighbors and co-workers and join BWCA as we move our feet to give others heat and spread awareness while having a lot of fun raising funds to help those struggling to keep the heat on in their homes right here in St. Clair County. Together we can warm hearts and hearths for those in need by moving our feet to give others heat! There will also be opportunities to purchase raffle tickets for wonderful "themed" gift baskets.